Dates for the first grading of 2013 have been set. Learn well and train hard to ensure you qualify for grading. 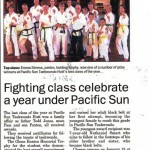 The Hutt City branch of Pacific Sun Taekwondo featured recently in the Hutt News. The story featured details on Hutt City’s end of year prizegiving, as below.